Get access to highly influential Psychology and Criminology research. Trouble viewing? Try the web version. Mobile user? Try the mobile version. Save 30% when you JOIN* the International Association for Correctional and Forensic Psychology (IACFP)! Join the IACFP and get access to SAGE's highly influential Psychology and Criminology/Criminal Justice content, including access to Criminal Justice and Behavior, official journal of the IACFP. The IACFP is an organization of behavioral scientists and practitioners who are concerned with the delivery of high-quality mental health services to criminal offenders, and with promoting and disseminating research on the etiology, assessment, and treatment of criminal behavior. *To receive your 30% discount you must enter Promo Code: MARCH30% in the "Comments and Special Instructions" field during the checkout process—the discounted rate will not be shown at time of checkout, but your credit card will be charged the discounted amount. Sign up for CJB email alerts! FYI. I can't access these is my library but thought others might be interested. Wisdom, N. M., Brown, W. L., Chen, D. K., & Collins, R. L. (2012). The Use of All Three Test of Memory Malingering Trials in Establishing the Level of Effort. Archives of Clinical Neuropsychology, 27(2), 208-212. The latest edition of the NAACP Legal Defense Fund's Death Row USA shows a decrease of 52 inmates between January 1 and October 1, 2011. Over the last decade, the total population of state and federal death rows has decreased significantly, from 3,682 inmates in 2000 to 3,199 inmates as of October 2011. California continues to have the largest death row population (721), followed by Florida (402), Texas (317), Pennsylvania (213), and Alabama (204). Neither California nor Pennsylvania have carried out an execution in the past six years. The report also contains information on the race of defendants and victims in the underlying murders for those executed since 1976. Among those, there were 261 instances of a black defendant executed for the murder of a white victim (accounting for 20% of all executions since 1976). Conversely, there were only 17 instances where a white defendant was executed for the murder of a black victim. (NAACP Legal Defense Fund, "Death Row USA," October 1, 2011, posted March 23, 2012). See also Death Row and Studies. Sasser (2012) has filed an appeal in the 8th Circuit Court of Appeals. Prior documents regarding this case can be found here. I can not comment on this case as I served as a witness in a prior evidentiary hearing. 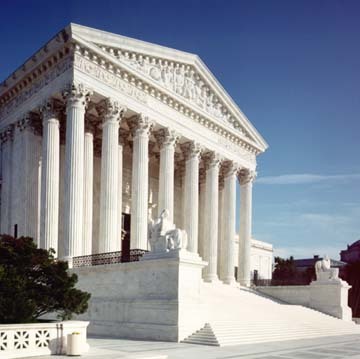 The U.S. Supreme Court granted review in two cases from Arizona and Ohio to explore whether death penalty appeals can continue if the defendant is mentally incompetent. Under the Court's prior rulings in Ford v. Wainwright (1986) and in Atkins v. Virginia (2002), defendants cannot be executed if they are insane or intellectually disabled (mentally retarded). The new cases, Ryan v. Gonzalez and Tibbals v. Carter, will decide whether mentally incompetent death row inmates are entitled to a stay of federal habeas proceedings because they cannot assist their counsel. The U.S. Courts of Appeals for the Ninth and Sixth Circuits, respectively, found that the defendants' competency was necessary during federal habeas review, thus staying the proceedings indefinitely. The states that asked the Court to review this question asserted that the appeals can go forward, despite the defendants inability to participate. The cases will be argued before the U.S. Supreme Court in its next term beginning in October. (L. Denniston, "Competency and death row challenges," SCOTUSblog, March 19, 2012). Read more about Ryan v. Gonzalez ( No. 10-930) and Tibbals v. Carter (No. 11-218). See Mental Illness and U.S. Supreme Court. Get free access to criminology resources--Join CRIMSPACE today! FYI. I have not joined and this post is not an endorsement. Just FYI. I might join to see if it provides information relevant to the ICDP blog. Subject: Get free access to criminology resources--Join CRIMSPACE today! Stay informed and connected—Join CRIMSPACE today! 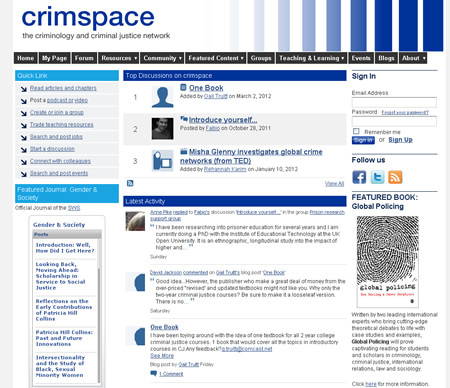 Have you joined* CRIMSPACE: the criminology and criminal justice network? With more than 3,000 members and growing daily, CRIMSPACE is the place to go to for resources in criminology or criminal justice, including discussions on a particular approach, or connections with other researchers, job and event listings, forums, groups, and more! What's trending now in the Forum and Featured Content? How can white collar crime and management problems be reduced in Africa? How does racial profiling affect community policing? Do "appropriate adults" provide a valuable service? What else can you do on CRIMSPACE? Join CRIMSPACE and start a discussion on the forum, search for a job, upload a video, or join a group—you could become the next featured member! Featured Members: Helen Jones, United Kingdom; Mathew Nwokwu, Nigeria; and Merwina Lou Abcede, Philippines—Meet other members and join the discussion! We are busier than ever on Facebook and Twitter! *If you have already joined, please continue to make use of the many facets of CRIMSPACE and invite your colleagues to join, too. As reported here at SCOTUSblog, the Supreme Court this morning kick off a week that has lots of criminal justice issues afoot with certiorari grants in two capital habeas cases: Ryan v. Gonzales (SCOTUSblog case page here) and Tibbales v. Carter. According to the folks at SCOTUSblog, "Ryan is about appointment of counsel for indigent capital defendants" and Tibbales concerns whether "capital prisoners have a right to competence in habeas proceedings, and can a court order an indefinite stay of habeas proceedings." Based on these descriptions, I surmise neither of these cases are likely to be blockbusters or even to have much impact outside of the technical world of federal habeas process. But the cases may end up providing the newer Justices with an opportunity to articulate their views on just how different death penalty all and practice should be. Thanks to Kevin Foley for sending me a copy of Brumfield v Cain (LA, 2012). Information regarding prior court decisions for Brumfield are available here. I have only skimmed the decision but a number of statements in the decision are of interest. First, the court made a clear endorsement of the AAIDD's latest manual on ID classification as the authoritative source for defining ID. Second, the importance of being a well prepared expert is evident in the following statement regarding one of the state's experts. The court said this about the state's lead expert: "The Court finds Dr. Hoppe’s failure (or inability, if counsel for the State was to blame) to 'obtain corroborating data from collateral sources' in this case renders his testimony here suspect." [pg 28, n.21]. Finally, the court appropriately endorsed the psychometric principle and methods of the standard error of measurement (SEM) and the Flynn Effect adjustment for norm obsolescence. Striking home here at the ICDP blog was the court's citation of IAP AP101 # 7 Report regarding the acceptance of the Flynn Effect by the majority of the scientific community. Starting on the bottom of page 33 and continuing on page 34.... "The Flynn Effect has been widely accepted as a fact in the scientific community, though explaining the cause of this phenomenon has proven more difficult. (Kevin S. McGrew, Is the Flynn Effect a Scientifically Accepted Fact?, Institute for Applied Psychometrics (2010)". BOOKS: "Most Deserving of Death?" The following article is very consistent with a constant theme of the ICDP blog...the importance of those involved in the assessment and Dx of individuals with MR/ID in the criminal justice to embrace the CHC theory of intelligence to improve the diagnostic and treatment practices in this environment. I strongly encourage readers to read the article below. A copy is available here, via the IQs Corner reading feature. In the annotated copy I provide additional comments and many links to relevant posts, journal articles, and relevant resources. > Breakthroughs in pharmacology, genetics, and neuroscience are transforming how society views criminals and thus how society should respond to criminal behavior. Although the criminal law has long been based on notions of culpability, science is undercutting the assumption that offenders are actually responsible for their criminal actions. Further, scientific advances have suggested that criminals can be changed at the biochemical level. The public has become well aware of these advances largely due to pervasive media reporting on these issues and also as a result of the pharmaceutical industry's incessant advertising of products designed to transform individuals by treating everything from depression to sexual dysfunction. This public familiarity with and expectation of scientific advances has set into motion the resurrection of the penological theory of rehabilitation that has lain dormant since the mid-1970s. The New Rehabilitation that is surfacing, however, differs in form from the rehabilitation of the earlier era by effecting change through biochemical interventions rather than through attempting to change an offender's character. This raises novel concerns about this New Rehabilitation that must be examined in light of the science that has sparked its revival. The journal Exceptionality had a small special issue addressing issues surrounding the involvement of individuals with disabilities in the criminal justice systems. The two key articles are featured below. Greenspan's article is a nice overview of the key issues in Atkins MR/ID death penalty cases. 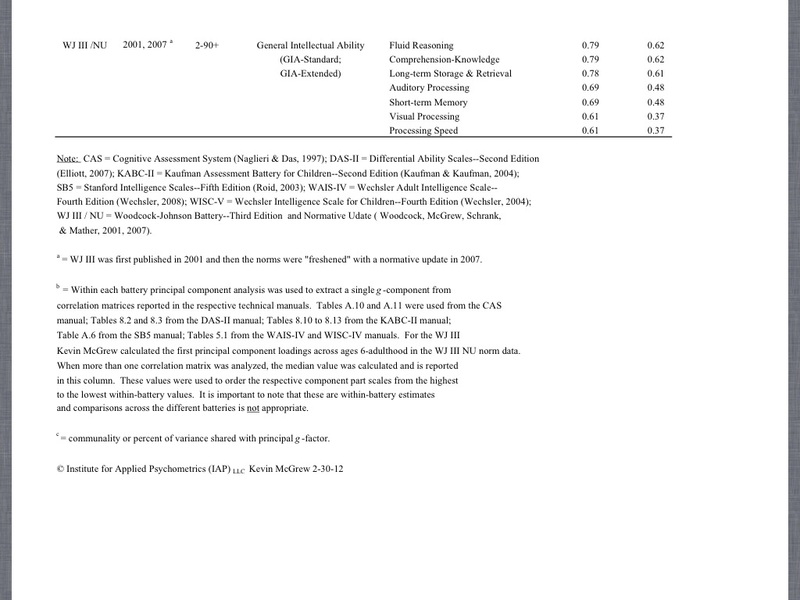 Historically the concept of general intelligence (g), as operationalized by intelligence test battery global “full scale” IQ scores, has been central to the definition and classification of individuals with a specific learning disability (SLD) as well as individuals with an intellectual disability (ID). More recently, contemporary definitions and operational criteria have elevated intelligence test battery composite or part scores to a more prominent role in diagnosis and classification of SLD and more recently in ID. In the case of SLD, third-method “consistency” definitions prominently feature component or part scores in (a) the identification of consistency between low achievement and relevant cognitive abilities or processing disorders and (b) the requirement that an individual demonstrate relative cognitive and achievement strengths (see Flanagan, Fiorello & Ortiz, 2010). The global IQ score is de-emphasized in the third-method SLD methods. In contrast, the 11th edition of the AAIDD Intellectual Disability: Definition, Classification, and Systems of Supports manual (AAIDD, 2010) placed general intelligence, and thus global composite IQ scores, as central to the definition of intellectual functioning. This has not been without challenge. For example, the AAIDD ID definition has been criticized for an over-reliance on the construct of general intelligence and for ignoring contemporary psychometric theoretical and empirical research that has converged on a multidimensional hierarchical model of intelligence (viz., Cattell-Horn-Carroll or CHC theory). The potential constraints of the “ID-as-a-general-intelligence-disability” definition was anticipated by the Committee on Disability Determination for Mental Retardation, in its National Research Council report “Mental Retardation: Determining Eligibility for Social Security Benefits” (Reschly, Meyers & Hartel, 2001). This national committee of experts concluded that “during the next decade, even greater alignment of intelligence tests and the IQ scores derived from them and the Horn-Cattell and Carroll models is likely. As a result, the future will almost certainly see greater reliance on part scores, such as IQ scores for Gc and Gf, in addition to the traditional composite IQ. That is, the traditional composite IQ may not be dropped, but greater emphasis will be placed on part scores than has been the case in the past” (Reschly et al., 2002, p. 94). The committee stated that “whenever the validity of one or more part scores (subtests, scales) is questioned, examiners must also question whether the test’s total score is appropriate for guiding diagnostic decision making. The total test score is usually considered the best estimate of a client’s overall intellectual functioning. However, there are instances in which, and individuals for whom, the total test score may not be the best representation of overall cognitive functioning.” (p. 106-107). The increased emphasis on intelligence test battery composite part scores in SLD and ID diagnosis and classification raises a number of measurement and conceptual issues (Reschly et al., 2002). For example, what are statistically significant differences? What is a meaningful difference? What appropriate cognitive abilities should serve as proxies of general intelligence when the global IQ is questioned? What should be the magnitude of the total test score? Appropriate cognitive abilities will only be the only issue discussed here. This issue addresses which component or part scores are more correlated with general intelligence (g)—that is, what component part scores are high g-loaders? The traditional consensus has been that measures of Gc (crystallized intelligence; comprehension-knowledge) and Gf (fluid intelligence or reasoning) are the highest g-loading measures and constructs and are the most likely candidates for elevated status when diagnosing ID (Reschly et al., 2002). Although not always stated explicitly, the third method consistency SLD definitions specify that an individual must demonstrate “at least an average level of general cognitive ability or intelligence” (Flanagan et al., 2010, p.745), a statement that implicitly suggests cognitive abilities and component scores with high g-ness. Table 1 is intended to provide guidance when using component part scores in the diagnosis and classification of SLD and ID (click on images to enlarge and use the browser zoom feature to view; it is recommended you click here to access a PDF copy of the table..and also zoom in on it). Table 1 presents a summary of the comprehensive, nationally normed, individually administered intelligence batteries that possess satisfactory psychometric characteristics (i.e., national norm samples, adequate reliability and validity for the composite g-score) for use in the diagnosis of ID and SLD. The “Composite g-score” column lists the global general intelligence score provided by each intelligence battery. This score is the best estimate of a person’s general intellectual ability, which currently is most relevant to the diagnosis of ID as per AAIDD. 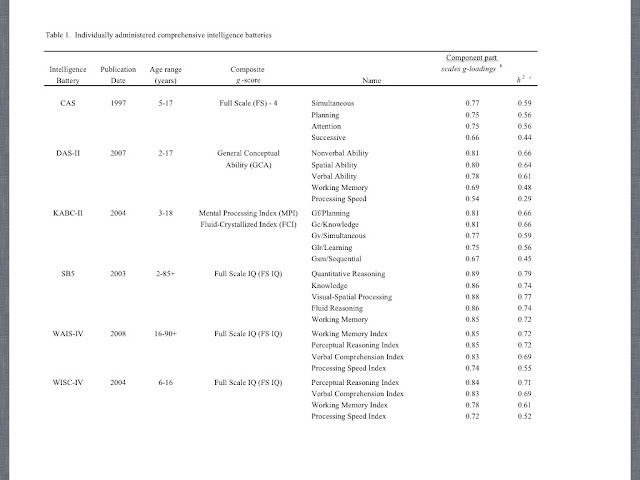 All composite g-scores listed in Table 1 meet Jensen’s (1998) psychometric sampling error criteria as valid estimates of general intelligence. As per Jensen’s number of tests criterion, all intelligence batteries g-composites are based on a minimum of nine tests that sample at least three primary cognitive ability domains. As per Jensen’s variety of tests criterion (i.e., information content, skills and demands for a variety of mental operations), the batteries, when viewed from the perspective of CHC theory, vary in ability domain coverage—four (CAS, SB5), five (KABC-II, WISC-IV, WAIS-IV), six (DAS-II) and seven (WJ III) (Flanagan, Ortiz & Alfonso, 2007; Keith & Reynolds, 2010). As recommended by Jensen (1998), “the particular collection of tests used to estimate g should come as close as possible, with some limited number of tests, to being a representative sample of all types of mental tests, and the various kinds of test should be represented as equally as possible” (p. 85). Users should consult sources such as Flanagan et al. (2007) and Keith and Reynolds, 2010) to determine how each intelligence battery approximates Jensen’s optimal design criterion, the specific CHC domains measured, and the proportional representation of the CHC domains in each batteries composite g-score. Also included in Table 1 are the component part scales provided by each battery (e.g., WAIS-IV Verbal Comprehension Index, Perceptual Reasoning Index, Working Memory Index, and Processing Speed Index), followed by their respective within-battery g-loadings. Examination of the g-ness of composite scores from existing batteries (see last three columns in Table 1) suggests the traditional assumption that measures of Gf and Gc are the best proxies of general intelligence may not hold across all intelligence batteries. In the case of the SB5, all five composite part scores are very similar in g-loadings (h2 = .72 to .79). No single SB5 composite part score appears better than the other SB5 scores for suggesting average general intelligence (when the global IQ score is not used for this purpose). At the other extreme is the WJ III where the Fluid Reasoning, Comprehension-Knowledge, Long-term Storage and Retrieval cluster scores are the best g-proxies for part-score based interpretation within the WJ III. The WJ III Visual Processing and Processing Speed clusters are not composite part scores that should be emphasized as indicators of general intelligence. Across all batteries that include a processing speed component part score (DAS-II, WAIS-IV, WISC-IV, WJ III) the respective processing speed scale is always the weakest proxy for general intelligence and thus, would not be viewed as a good estimate of general intelligence. It is also clear that one cannot assume that composites with similar sounding names of measured abilities should have similar relative g-ness status within different batteries. For example, the Gv (visual-spatial or visual processing) clusters in the DAS-II (Spatial Ability), SB5 (Visual-Spatial Processing) are relatively strong g-measures within their respective battery, but the same cannot be said for the WJ III Visual Processing cluster. Even more interesting are the differences in the WAIS-IV and WISC-IV relative g-loadings for similarly sounding index scores. For example, the Working Memory Index is the highest g-loading component part score (tied with Perceptual Reasoning Index) in the WAIS-IV but is only third (out of four) in the WISC-IV. The Working Memory Index is comprised of the Digit Span and Arithmetic subtests in the WAIS-IV and the Digit Span and the Letter-Number Sequencing subtests in the WISC-IV. The Arithmetic subtest has been reported to be a factorially complex test which may tap fluid intelligence (Gf-RQ—quantitative reasoning), quantitative knowledge (Gq), working memory (Gsm), and possible processing speed (Gs; Keith & Reynolds, 2010; Phelps, McGrew, Knopik & Ford, 2005). The factorially complex characteristics of the Arithmetic subtest (which, in essence, makes it function like a mini-g proxy) would explain why the WAIS-IV Working Memory Index is a good proxy for g in the WAIS-IV but not in the WISC-IV. The WAIS-IV and WISC-IV Working Memory Index scales, although named the same, are not measuring identical constructs. A critical caveat is that the g-loadings cannot be compared across different batteries. g-loadings may change when the mixture of measures included in the analyses change. Different "flavors" of g can result (Carroll, 1993; Jensen, 1998). The only way to compare the g-ness across batteries is with appropriately designed cross- or joint-battery analysis (e.g., WAIS-IV, SB5 and WJ III analyzed in a common sample). The above within and across intelligence battery examples illustrates that those who use component part scores as an estimate of a person’s general intelligence must be aware of the composition and psychometric g-ness of the component scores within each intelligence battery. Not all component part scores in different intelligence batteries are created equal (with regard to g-ness). Also, not all similarly named factor-based composite scores may measure the same identical construct and may vary in degree of within battery g-ness. This is not a new problem in the context of naming factors in factor analysis, and by extension, factor-based intelligence test composite scores, Cliff (1983) described this nominalistic fallacy in simple language—“if we name something, this does not mean we understand it” (p. 120). The h2 values are the values that should be used to compare the relative amount of g-variance present in the component part scores within each intelligence battery.